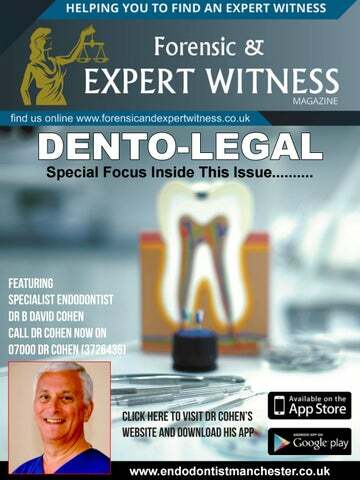 Dr B David Cohen The Federation of Forensic & Expert Witnesses is delighted to announce Dr B David Cohen - Specialist Endodontist & Dental Expert Witness of the year. Dr Cohen has been selected as the recipient of this year’s Independent Award. This Award scheme was created by the Federation of Forensic & Expert Witnesses to profile it’s members who have shown a commitment to contribute outstanding work within their chosen speciality. In this particular case, Dr B David Cohen received this honour in recognition of the lifetime of commitment he has given to the field of Dentistry; both to his patients and to the Expert Witness Industry. Independent to the Federation, these Awards are designed to raise the profile and highlight the ‘best experts’ in their given fields of expertise. The Federation achieves this goal by making Lawyers and Barristers, who follow the Federation via links to its’ website or read its’ E-mag, aware of the recipients of these accolades. Dr B David Cohen is a Manchester based expert and has a special interest in Dentistry, Dental negligence and personal injury cases including all subjects like: •	General Dentistry •	Accidents •	Slip and trips •	Road traffic accidents •	Accidents at work •	Sports accidents •	Endodontic problems inc. clinical negligence Specific area of expertise in clinical negligence cases is that of endodontics (root canal treatment/therapy). And of course is available to advise in any of these subjects that may need a dento - legal report needed for the courts. We fully recommend Dr B David Cohen and we are pleased to announce him as this year’s recipient. I am a Specialist Endodontist, and I like to think that for over 30 years I have been helping general dental practitioners solve their endodontic problems. In that time I have treated something over 25,000 teeth! I qualified in 1971 from the Royal Dental Hospital of London and 1972 from the Royal College of Surgeons of England. Following qualification I worked in general practice in Manchester. At a lecture by an endodontist in 1976 I became interested in Endodontics, and in order to advance my knowledge in this field I undertook a number of postgraduate courses in the United States at Boston University School of Graduate Dentistry, under the leadership of Dr. Herbert Schilder. In 1981 I commenced part-time postgraduate research in Endodontics, which led to me being awarded an MSc in 1984 on the strength of a thesis entitled "An Investigation into the relative merits of some Endodontics Filling Systems". In 1986 I was invited to undertake further research work, culminating in me being awarded a PhD by the University of Manchester in 1991 on the basis of my thesis entitled "Development and Evaluation of Endodontics Filling and Pulp Capping Materials". This led to the development of new materials in both areas of root filling and pulp capping and worldwide patents for such materials. In 1981 I opened a practice 'Limited to Endodontics' part-time, which has now grown to me being in full time practice. I now spread my time between Manchester, Nottingham, and Crewe, and latterly Gibraltar. For a number of years I taught postgraduate Endodontics and undergraduate studies as a Lecturer at Manchester Dental Hospital, and I currently hold the position of Honorary Research Associate at Manchester University. I was admitted to the endodontic specialist register as soon as the register was inaugurated in 1998. I have written widely on endodontic subjects and in 1994 I was a Visiting Fellow to the Singapore Ministry of Health. I have also lectured extensively in the U.K. and U.S.A. I have served as the President of the British Endodontic Society and Chairman and/or executive member of a number of local dental and endodontic associations. I have also since 1979 been a member and regular attender at meetings of the American Association of Endodontists. In addition, I have been producing dento-legal reports for many years, and have to date produced over 2,000 reports for solicitors, both claimant and defendant. 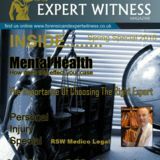 In 2005 I was awarded a Certificate of Expert Witness Accreditation by Cardiff University, in 2008 I was accepted as a member of the Expert Witness Institute, and in 2013 the Certificate in Medical Reporting. Outside dentistry I love spending time with my family, especially my six young grandchildren. I also enjoy learning Spanish and violin (both rather badly), photography, collecting whisky and vodka miniatures and as I have a pilot’s licence, I really enjoy flying. I have been very active in my local Jewish community, including a stint of three years as the President of my local synagogue, and I have recently finished a 4 year term as an LEA Governor at a local high school.